Bandicam, fully featured and functional video capture software, is taking the gaming world by storm. Bandicam Company released Bandicam globally earlier this year. In less than three months, it has become very popular among online gamers. Bandicam, because of its high quality recording and low computer lag, is the perfect program for capturing and sharing online game video captures. Bandicam is a powerful, lightweight program used to record anything on the computer desktop screen. Originally released two years ago; it has become very popular, like Fraps, HyperCam and Camtasia, in the Asian market. Now, game-play videos captured by Bandicam are spreading all across YouTube. It has become essential software for online gamers. 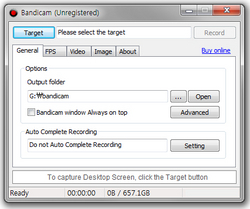 Bandicam provides FPS management, and video-recording of games and streaming videos. While functions are similar other video capture software, Bandicam is focused uniquely designed to meet online game users' needs. The quality and the small size of recorded files are key features of Bandicam. It uses DirectX/OpenGL capturing technology to get high-quality recording files, and data-compression technology to make the files small. Both of the technologies used by Bandicam are embedded in commercial online games such as Dragon Ball Online, Dungeon Fighter, Bubble Fighter, GunZ, and Ghost Online. Another advantage of Bandicam is that it minimizes CPU usage during the conversion of the streaming video. Bandicam can record various games like World of Warcraft, Minecraft, StarCraft 2, RuneScape, MapleStory, Second Life or streaming video with much less lag. High-quality, small recording file size, and less lag are essential for online game recording. The proof is online. Just search YouTube for the videos online gamers everywhere are recording with Bandicam. Recently, Bandicam Company announced that Bandicam will be updated in March. The new version will improve DirectX 10 and 11 game recording further reduce lag, and support more languages (French, Chinese, Spanish). Bandicam Company, developer of Bandicam, is a multimedia-based company that includes a business-to-business game capture library, video library, and data-compression solutions. Bandicam Company is a well-known in the online game developer community. Many online game companies such as NC soft, Nexon, Tencent, Dragonfly, Eyedentity Games, and Maiet Entertainment are using Bandicam Company multi-media solutions. Bandicam was their first business to customer product.